If you forgot your Log In information, go to bottom of this page. BE SURE TO KEEP YOUR EMAIL, PHONE NUMBER, AND ADDRESS UP TO DATE WITH THE LOCAL UNION OFFICE. The next General Membership Meeting will be held on Tuesday, MAY 21, 2019 beginning at 6:30pm. Dinner will be served starting at 5:30pm. I.B.E.W. 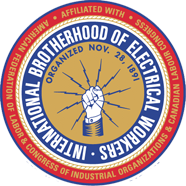 Local 58 Detroit, Representing Electrical, Telecom, Broadcast and Manufacturing workers in Eastern Michigan for over 100 years. Applications for the DETROIT ELECTRICAL APPRENTICESHIP TRAINING CENTER is closed at this time. Dates will be posted when available. Applicants must be 17 years of age, have completed one year of high school algebra, and have a high school diploma or a GED. Local 58 has a proud history of making a difference in our communities. Touching the lives of people through various acts of community service, recognizing that it has a particular responsibility to be a good corporate citizen. Local 58 has made it an integral part of its mission to invest in the future of the community and to give back to society. Volunteers are always needed to participate in these activities. Contact the Union Hall (313) 963.2130 for further information to volunteer and participate or watch for our sign up form on the committee page.